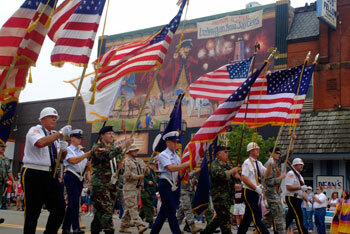 West Michigan Events Calendar - Ludington Area Jaycees Freedom Festival, a Very Festive 4th! Ludington Area Jaycees Freedom Festival, a Very Festive 4th! Patriotism is alive and well here in Ludington, Michigan, as demonstrated in the annual Freedom Festival, held every year since 1874. Sponsored by the Ludington Area Jaycees, this event is one of the few great July 4th festivals still in existence in Michigan. The fun begins July 3rd around 6pm with the Children's and Pet Parade at the south end of Ferry Street in downtown Ludington. Local children decorate their wagons or bikes, and even try to dress the family pet in red, white, and blue. Categories are Best Group Entry, Most Original, Most Patriotic, and Best Use of Pet, with prizes awarded to the winner of each. All participants receive a goody bag. It's a great kick-off to the holiday, and so much fun to watch. Line-up is at 6pm at the corner of Ferry and Loomis Streets with the parade heading east to Waterfront Park. The Freedom Festival Grand Parade gets underway July 4th at 2pm and features floats, bands, politicians, local residents, and of course, the Scottville Clown Band. Thousands line Ludington Avenue to watch this hometown parade as they march downtown from Madison Street to Lakeshore Drive, all sharing the warmth and excitement of our nation's birthday. If you would like to enter a float into the parade, please go to ludingtonareajaycees.org for more information. What would July 4th be without fireworks, and Ludington doesn't disappoint its residents or visitors. 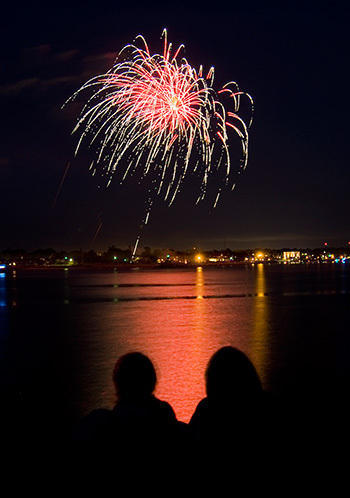 On the evening of July 4th starting around dusk (approximately 10:30pm), pick your favorite "viewing" site, such as Stearns Beach or Waterfront Park, and enjoy the show. Basically, anywhere you see water, you'll see the fireworks. Most people make an evening of it, arriving early to picnic or let the kids enjoy their sparklers. The colorful 20-minute display delights the crowd watching on land and from boats. It's the perfect ending to this annual celebration. Click here for more information on other firework displays in the area. The Ludington Area Jaycees are currently seeking sponsorships and donations for their Freedom Festival Fireworks which light up Lake Michigan each 4th of July. The Freedom Festival brings tens of thousands of people to the beautiful Lake Michigan coastal city of Ludington and into local businesses operating there. The event is 100% funded by donations from local businesses, organizations, and individuals and this year's fireworks budget is $25,000. The Jaycees hold two annual fundraisers for the fireworks fund: The Crazy Bartender Contest in April and the Light Up the Night Music Series in October/November but still need donations and sponsorships to make up the difference. For more information on donations, visit ludingtonareajaycees.org or e-mail. info@ludingtonareajaycees.org. Held in conjunction with Freedom Festival activities, the West Shore Art Fair is the first weekend in July (July 7 & 8, 2018) in Rotary Park. 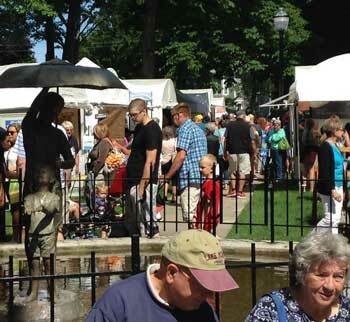 The juried fine art and fine craft fair features over 100 artists in an open air setting. Approximately six weeks later in the same location, the Gold Coast Artisan Fair comes to town, featuring more crafts. 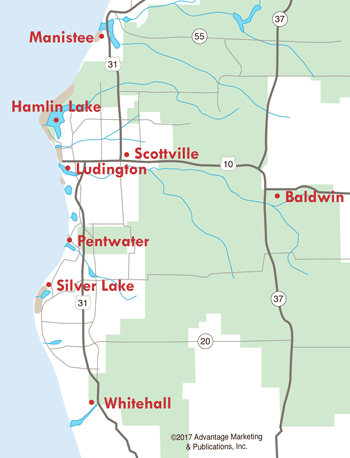 Check out Ludington Lodging for places to stay during the Freedom Festival and Ludington Restaurants for great places to eat.